Definition at line 77 of file stdsoap2.h. Definition at line 72 of file stdsoap2.h. Definition at line 1249 of file stdsoap2.h. Definition at line 1250 of file stdsoap2.h. Definition at line 1251 of file stdsoap2.h. Definition at line 1252 of file stdsoap2.h. Definition at line 1253 of file stdsoap2.h. Definition at line 1247 of file stdsoap2.h. Referenced by http_parse(), http_response(), soap_accept(), soap_append_lab(), soap_array_pointer_lookup(), soap_array_reference(), soap_attachment(), soap_attribute(), soap_begin(), soap_begin_count(), soap_begin_recv(), soap_begin_send(), soap_bind(), soap_copy_ArrayOf_USCORExsd_USCOREstring(), soap_copy_context(), soap_copy_ns2__checkRegExp(), soap_copy_ns2__checkRegExpResponse(), soap_copy_ns2__getDataResources(), soap_copy_ns2__getDataResourcesResponse(), soap_copy_ns2__getDataTypeDef(), soap_copy_ns2__getDataTypeDefResponse(), soap_copy_ns2__getDataTypePattern(), soap_copy_ns2__getDataTypePatternResponse(), soap_copy_ns2__getDataTypesId(), soap_copy_ns2__getDataTypesIdResponse(), soap_copy_ns2__getDataTypesName(), soap_copy_ns2__getDataTypesNameResponse(), soap_copy_ns2__getDataTypeSynonyms(), soap_copy_ns2__getDataTypeSynonymsResponse(), soap_copy_ns2__getDataTypeURI(), soap_copy_ns2__getDataTypeURIResponse(), soap_copy_ns2__getDataTypeURIs(), soap_copy_ns2__getDataTypeURIsResponse(), soap_copy_ns2__getJavaLibraryVersion(), soap_copy_ns2__getJavaLibraryVersionResponse(), soap_copy_ns2__getLocation(), soap_copy_ns2__getLocationResponse(), soap_copy_ns2__getLocations(), soap_copy_ns2__getLocations_(), soap_copy_ns2__getLocationsResponse(), soap_copy_ns2__getLocationsResponse_(), soap_copy_ns2__getMiriamURI(), soap_copy_ns2__getMiriamURIResponse(), soap_copy_ns2__getName(), soap_copy_ns2__getNameResponse(), soap_copy_ns2__getNames(), soap_copy_ns2__getNamesResponse(), soap_copy_ns2__getOfficialDataTypeURI(), soap_copy_ns2__getOfficialDataTypeURIResponse(), soap_copy_ns2__getResourceInfo(), soap_copy_ns2__getResourceInfoResponse(), soap_copy_ns2__getResourceInstitution(), soap_copy_ns2__getResourceInstitutionResponse(), soap_copy_ns2__getResourceLocation(), soap_copy_ns2__getResourceLocationResponse(), soap_copy_ns2__getServicesInfo(), soap_copy_ns2__getServicesInfoResponse(), soap_copy_ns2__getServicesVersion(), soap_copy_ns2__getServicesVersionResponse(), soap_copy_ns2__getURI(), soap_copy_ns2__getURIResponse(), soap_copy_ns2__isDeprecated(), soap_copy_ns2__isDeprecatedResponse(), soap_copy_SOAP_ENV__Code(), soap_copy_SOAP_ENV__Detail(), soap_copy_SOAP_ENV__Fault(), soap_copy_SOAP_ENV__Header(), soap_copy_SOAP_ENV__Reason(), soap_copy_std__string(), soap_count_attachments(), soap_dealloc(), soap_delete(), soap_done(), soap_element(), soap_element_begin_in(), soap_element_end_in(), soap_element_end_out(), soap_element_href(), soap_element_start_end_out(), soap_embedded(), soap_embedded_id(), soap_end_block(), soap_end_count(), soap_end_recv(), soap_end_send(), soap_fcopy(), soap_first_block(), soap_flush(), soap_free_iht(), soap_free_ns(), soap_free_pht(), soap_free_temp(), soap_get_mime_attachment(), soap_get_pi(), soap_getchunkchar(), soap_getdimehdr(), soap_getmimehdr(), soap_id_enter(), soap_id_forward(), soap_id_lookup(), soap_ignore_element(), soap_init(), soap_init_iht(), soap_init_pht(), soap_instantiate_ArrayOf_USCORExsd_USCOREstring(), soap_instantiate_ns2__checkRegExp(), soap_instantiate_ns2__checkRegExpResponse(), soap_instantiate_ns2__getDataResources(), soap_instantiate_ns2__getDataResourcesResponse(), soap_instantiate_ns2__getDataTypeDef(), soap_instantiate_ns2__getDataTypeDefResponse(), soap_instantiate_ns2__getDataTypePattern(), soap_instantiate_ns2__getDataTypePatternResponse(), soap_instantiate_ns2__getDataTypesId(), soap_instantiate_ns2__getDataTypesIdResponse(), soap_instantiate_ns2__getDataTypesName(), soap_instantiate_ns2__getDataTypesNameResponse(), soap_instantiate_ns2__getDataTypeSynonyms(), soap_instantiate_ns2__getDataTypeSynonymsResponse(), soap_instantiate_ns2__getDataTypeURI(), soap_instantiate_ns2__getDataTypeURIResponse(), soap_instantiate_ns2__getDataTypeURIs(), soap_instantiate_ns2__getDataTypeURIsResponse(), soap_instantiate_ns2__getJavaLibraryVersion(), soap_instantiate_ns2__getJavaLibraryVersionResponse(), soap_instantiate_ns2__getLocation(), soap_instantiate_ns2__getLocationResponse(), soap_instantiate_ns2__getLocations(), soap_instantiate_ns2__getLocations_(), soap_instantiate_ns2__getLocationsResponse(), soap_instantiate_ns2__getLocationsResponse_(), soap_instantiate_ns2__getMiriamURI(), soap_instantiate_ns2__getMiriamURIResponse(), soap_instantiate_ns2__getName(), soap_instantiate_ns2__getNameResponse(), soap_instantiate_ns2__getNames(), soap_instantiate_ns2__getNamesResponse(), soap_instantiate_ns2__getOfficialDataTypeURI(), soap_instantiate_ns2__getOfficialDataTypeURIResponse(), soap_instantiate_ns2__getResourceInfo(), soap_instantiate_ns2__getResourceInfoResponse(), soap_instantiate_ns2__getResourceInstitution(), soap_instantiate_ns2__getResourceInstitutionResponse(), soap_instantiate_ns2__getResourceLocation(), soap_instantiate_ns2__getResourceLocationResponse(), soap_instantiate_ns2__getServicesInfo(), soap_instantiate_ns2__getServicesInfoResponse(), soap_instantiate_ns2__getServicesVersion(), soap_instantiate_ns2__getServicesVersionResponse(), soap_instantiate_ns2__getURI(), soap_instantiate_ns2__getURIResponse(), soap_instantiate_ns2__isDeprecated(), soap_instantiate_ns2__isDeprecatedResponse(), soap_instantiate_SOAP_ENV__Code(), soap_instantiate_SOAP_ENV__Detail(), soap_instantiate_SOAP_ENV__Fault(), soap_instantiate_SOAP_ENV__Header(), soap_instantiate_SOAP_ENV__Reason(), soap_instantiate_std__string(), soap_is_embedded(), soap_lookup_type(), soap_match_array(), soap_match_tag(), soap_move(), soap_new_block(), soap_next_block(), soap_pointer_enter(), soap_pointer_lookup(), soap_poll(), soap_pop_block(), soap_pop_namespace(), soap_push_block(), soap_push_namespace(), soap_push_ns(), soap_putdime(), soap_putdimehdr(), soap_putmime(), soap_putmimehdr(), soap_recv(), soap_recv_fault(), soap_recv_raw(), soap_reference(), soap_register_plugin_arg(), soap_resolve(), soap_resolve_attachment(), soap_revert(), soap_s2QName(), soap_save_block(), soap_send_fault(), soap_set_attr(), soap_string_in(), soap_try_connect_command(), soap_unlink(), soap_update_ptrs(), soap_utilize_ns(), soap_value(), soap_wstring_in(), tcp_closesocket(), tcp_connect(), tcp_disconnect(), tcp_gethost(), and tcp_shutdownsocket(). Definition at line 1248 of file stdsoap2.h. Referenced by soap_end_send(), soap_flush_raw(), soap_getchunkchar(), and soap_recv_raw(). Definition at line 957 of file stdsoap2.h. Definition at line 975 of file stdsoap2.h. Definition at line 970 of file stdsoap2.h. Definition at line 705 of file stdsoap2.h. Referenced by frecv(), and fsend(). Definition at line 935 of file stdsoap2.h. Definition at line 953 of file stdsoap2.h. Definition at line 948 of file stdsoap2.h. Definition at line 469 of file stdsoap2.h. Definition at line 471 of file stdsoap2.h. Definition at line 472 of file stdsoap2.h. Definition at line 473 of file stdsoap2.h. Definition at line 475 of file stdsoap2.h. Definition at line 470 of file stdsoap2.h. Definition at line 465 of file stdsoap2.h. Definition at line 463 of file stdsoap2.h. Definition at line 464 of file stdsoap2.h. Definition at line 466 of file stdsoap2.h. Definition at line 467 of file stdsoap2.h. Definition at line 468 of file stdsoap2.h. Definition at line 474 of file stdsoap2.h. Definition at line 733 of file stdsoap2.h. Definition at line 1154 of file stdsoap2.h. Referenced by soap_begin_count(), soap_begin_recv(), and soap_begin_send(). Definition at line 1163 of file stdsoap2.h. Referenced by soap_element(), and soap_set_attr(). Definition at line 841 of file stdsoap2.h. Referenced by soap_base642s(), soap_get_http_body(), soap_getbase64(), soap_gethex(), soap_peek_element(), soap_string_in(), and soap_wstring_in(). Definition at line 814 of file stdsoap2.h. Referenced by soap_accept(), soap_begin_recv(), soap_begin_send(), soap_bind(), soap_copy_stream(), soap_end_recv(), soap_end_send(), soap_flush(), soap_getchunkchar(), soap_print_fault_location(), soap_recv_raw(), soap_send_raw(), tcp_connect(), and tcp_gethost(). Definition at line 1118 of file stdsoap2.h. Referenced by soap_string_in(), and soap_string_out(). Definition at line 1119 of file stdsoap2.h. Referenced by soap_out_std__string(), soap_outstring(), and soap_outwstring(). Definition at line 1116 of file stdsoap2.h. Definition at line 1117 of file stdsoap2.h. Referenced by soap_s2string(), soap_string_in(), and soap_string_out(). Definition at line 1150 of file stdsoap2.h. Referenced by soap_copy_context(), soap_dealloc(), soap_delete(), soap_done(), soap_end(), soap_print_fault(), and soap_sprint_fault(). Definition at line 996 of file stdsoap2.h. Referenced by soap_recv_fault(), and soap_set_fault(). Definition at line 693 of file stdsoap2.h. Definition at line 1904 of file stdsoap2.h. Definition at line 1909 of file stdsoap2.h. Definition at line 1907 of file stdsoap2.h. Definition at line 114 of file stdsoap2.h. Definition at line 1148 of file stdsoap2.h. Definition at line 1036 of file stdsoap2.h. Definition at line 1012 of file stdsoap2.h. Definition at line 1910 of file stdsoap2.h. Definition at line 1073 of file stdsoap2.h. Definition at line 1068 of file stdsoap2.h. Referenced by soap_begin_recv(), soap_getdime(), soap_putdime(), and soap_recv(). Definition at line 1030 of file stdsoap2.h. Referenced by soap_getdime(), soap_getdimehdr(), and soap_set_fault(). Definition at line 1027 of file stdsoap2.h. Definition at line 1028 of file stdsoap2.h. Referenced by soap_end_recv(), and soap_set_fault(). Definition at line 1070 of file stdsoap2.h. Referenced by soap_begin_recv(), soap_envelope_end_out(), and soap_putdime(). Definition at line 1069 of file stdsoap2.h. Referenced by soap_envelope_end_out(), soap_getdimehdr(), and soap_putdime(). Definition at line 1072 of file stdsoap2.h. Definition at line 1029 of file stdsoap2.h. Referenced by soap_getdimehdr(), and soap_set_fault(). Definition at line 1071 of file stdsoap2.h. Referenced by soap_begin_recv(), soap_getdimehdr(), soap_putdime(), and soap_putdimehdr(). Definition at line 1123 of file stdsoap2.h. Definition at line 1122 of file stdsoap2.h. Definition at line 1121 of file stdsoap2.h. Definition at line 1019 of file stdsoap2.h. Referenced by soap_id_enter(), and soap_set_fault(). Definition at line 780 of file stdsoap2.h. Definition at line 779 of file stdsoap2.h. Referenced by frecv(), fsend(), soap_accept(), and tcp_connect(). Definition at line 786 of file stdsoap2.h. Definition at line 778 of file stdsoap2.h. Referenced by frecv(), fsend(), soap_accept(), soap_poll(), tcp_connect(), and tcp_disconnect(). Definition at line 1105 of file stdsoap2.h. Definition at line 1099 of file stdsoap2.h. Referenced by http_parse_header(), soap_begin_count(), soap_begin_recv(), soap_begin_send(), soap_clr_dime(), soap_count_attachments(), soap_end_recv(), soap_envelope_begin_out(), soap_envelope_end_out(), soap_getdimehdr(), soap_peek_element(), soap_putdime(), soap_puthttphdr(), soap_recv(), and soap_set_dime(). Definition at line 1097 of file stdsoap2.h. Referenced by soap_get_pi(), soap_getutf8(), soap_s2string(), soap_s2wchar(), and soap_string_in(). Definition at line 1100 of file stdsoap2.h. Referenced by http_parse_header(), soap_begin_count(), soap_begin_recv(), soap_begin_send(), soap_clr_mime(), soap_count_attachments(), soap_end_recv(), soap_envelope_begin_out(), soap_get_mime_attachment(), soap_puthttphdr(), soap_putmime(), and soap_set_mime(). Definition at line 1101 of file stdsoap2.h. Referenced by soap_attachment(), soap_begin_count(), soap_begin_send(), soap_count_attachments(), soap_end_recv(), soap_envelope_begin_out(), soap_envelope_end_out(), soap_peek_element(), and soap_puthttphdr(). Definition at line 1103 of file stdsoap2.h. Referenced by http_parse_header(), soap_poll(), and tcp_connect(). Definition at line 1098 of file stdsoap2.h. Referenced by soap_begin_count(), soap_begin_send(), soap_end_send(), soap_putdime(), soap_putmime(), soap_response(), and soap_try_connect_command(). Definition at line 1102 of file stdsoap2.h. Referenced by soap_begin_count(), soap_begin_recv(), soap_begin_send(), soap_end_recv(), soap_end_send(), soap_flush(), soap_get_http_body(), soap_puthttphdr(), soap_recv_raw(), soap_response(), and soap_try_connect_command(). Definition at line 1162 of file stdsoap2.h. Referenced by soap_begin(), soap_end_recv(), and soap_end_send(). Definition at line 1160 of file stdsoap2.h. Referenced by soap_body_end_in(), and soap_body_end_out(). Definition at line 1161 of file stdsoap2.h. Referenced by soap_envelope_end_in(), and soap_envelope_end_out(). Definition at line 1157 of file stdsoap2.h. Referenced by soap_getheader(), and soap_putheader(). Definition at line 1165 of file stdsoap2.h. Definition at line 993 of file stdsoap2.h. Referenced by fsend(), http_parse(), soap_begin_recv(), soap_closesock(), soap_element_end_in(), soap_end_recv(), soap_get_mime_attachment(), soap_getattrval(), soap_getdime(), soap_getdimefield(), soap_getdimehdr(), soap_getindependent(), soap_getline(), soap_move(), soap_peek_element(), soap_poll(), soap_putdime(), soap_putmime(), soap_send_fault(), and soap_set_fault(). Definition at line 1015 of file stdsoap2.h. Referenced by http_post(), http_response(), soap_append_lab(), soap_attachment(), soap_dime_forward(), soap_flush_raw(), soap_get_mime_attachment(), soap_getattrval(), soap_getdime(), soap_getdimefield(), soap_getmimehdr(), soap_id_forward(), soap_instantiate_ArrayOf_USCORExsd_USCOREstring(), soap_instantiate_ns2__checkRegExp(), soap_instantiate_ns2__checkRegExpResponse(), soap_instantiate_ns2__getDataResources(), soap_instantiate_ns2__getDataResourcesResponse(), soap_instantiate_ns2__getDataTypeDef(), soap_instantiate_ns2__getDataTypeDefResponse(), soap_instantiate_ns2__getDataTypePattern(), soap_instantiate_ns2__getDataTypePatternResponse(), soap_instantiate_ns2__getDataTypesId(), soap_instantiate_ns2__getDataTypesIdResponse(), soap_instantiate_ns2__getDataTypesName(), soap_instantiate_ns2__getDataTypesNameResponse(), soap_instantiate_ns2__getDataTypeSynonyms(), soap_instantiate_ns2__getDataTypeSynonymsResponse(), soap_instantiate_ns2__getDataTypeURI(), soap_instantiate_ns2__getDataTypeURIResponse(), soap_instantiate_ns2__getDataTypeURIs(), soap_instantiate_ns2__getDataTypeURIsResponse(), soap_instantiate_ns2__getJavaLibraryVersion(), soap_instantiate_ns2__getJavaLibraryVersionResponse(), soap_instantiate_ns2__getLocation(), soap_instantiate_ns2__getLocationResponse(), soap_instantiate_ns2__getLocations(), soap_instantiate_ns2__getLocations_(), soap_instantiate_ns2__getLocationsResponse(), soap_instantiate_ns2__getLocationsResponse_(), soap_instantiate_ns2__getMiriamURI(), soap_instantiate_ns2__getMiriamURIResponse(), soap_instantiate_ns2__getName(), soap_instantiate_ns2__getNameResponse(), soap_instantiate_ns2__getNames(), soap_instantiate_ns2__getNamesResponse(), soap_instantiate_ns2__getOfficialDataTypeURI(), soap_instantiate_ns2__getOfficialDataTypeURIResponse(), soap_instantiate_ns2__getResourceInfo(), soap_instantiate_ns2__getResourceInfoResponse(), soap_instantiate_ns2__getResourceInstitution(), soap_instantiate_ns2__getResourceInstitutionResponse(), soap_instantiate_ns2__getResourceLocation(), soap_instantiate_ns2__getResourceLocationResponse(), soap_instantiate_ns2__getServicesInfo(), soap_instantiate_ns2__getServicesInfoResponse(), soap_instantiate_ns2__getServicesVersion(), soap_instantiate_ns2__getServicesVersionResponse(), soap_instantiate_ns2__getURI(), soap_instantiate_ns2__getURIResponse(), soap_instantiate_ns2__isDeprecated(), soap_instantiate_ns2__isDeprecatedResponse(), soap_instantiate_SOAP_ENV__Code(), soap_instantiate_SOAP_ENV__Detail(), soap_instantiate_SOAP_ENV__Fault(), soap_instantiate_SOAP_ENV__Header(), soap_instantiate_SOAP_ENV__Reason(), soap_instantiate_std__string(), soap_malloc(), soap_new_block(), soap_peek_element(), soap_pointer_enter(), soap_push_block(), soap_push_namespace(), soap_push_ns(), soap_register_plugin_arg(), soap_s2string(), soap_save_block(), soap_set_attr(), soap_set_dime_attachment(), soap_set_fault(), and soap_set_mime_attachment(). Definition at line 777 of file stdsoap2.h. Referenced by soap_s2int(), soap_s2long(), soap_s2LONG64(), soap_s2ULONG64(), soap_s2unsignedInt(), and soap_s2unsignedLong(). Definition at line 994 of file stdsoap2.h. Referenced by soap_fdelete(), soap_has_copies(), soap_isnumeric(), soap_valid_mime_boundary(), and tcp_gethost(). Definition at line 802 of file stdsoap2.h. Referenced by frecv(), fsend(), soap_s2int(), soap_s2long(), soap_s2LONG64(), soap_s2ULONG64(), soap_s2unsignedInt(), soap_s2unsignedLong(), and tcp_gethost(). Definition at line 785 of file stdsoap2.h. Definition at line 1006 of file stdsoap2.h. Definition at line 1007 of file stdsoap2.h. Referenced by soap_copy_fault(), soap_recv_fault(), and soap_set_fault(). Definition at line 1041 of file stdsoap2.h. Referenced by frecv(), fsend(), soap_accept(), soap_poll(), soap_set_fault(), and tcp_connect(). Definition at line 1059 of file stdsoap2.h. Referenced by http_response(), soap_puthttphdr(), and soap_response(). Definition at line 82 of file stdsoap2.h. Definition at line 86 of file stdsoap2.h. Definition at line 90 of file stdsoap2.h. Definition at line 94 of file stdsoap2.h. Definition at line 98 of file stdsoap2.h. Definition at line 102 of file stdsoap2.h. Definition at line 106 of file stdsoap2.h. Definition at line 110 of file stdsoap2.h. Definition at line 1057 of file stdsoap2.h. Definition at line 1194 of file stdsoap2.h. Referenced by soap_append_lab(), soap_clr_attr(), soap_connect_command(), soap_copy_context(), soap_dealloc(), soap_delete(), soap_done(), soap_end(), soap_end_block(), soap_envelope_begin_in(), soap_free_iht(), soap_free_ns(), soap_free_pht(), soap_free_temp(), soap_next_block(), soap_peek_element(), soap_pop_block(), soap_pop_namespace(), soap_push_namespace(), soap_register_plugin_arg(), soap_resolve(), soap_resolve_attachment(), soap_set_attr(), soap_set_namespaces(), and soap_unlink(). Definition at line 701 of file stdsoap2.h. Referenced by soap_bind(), and tcp_connect(). Definition at line 1064 of file stdsoap2.h. Referenced by http_post(), and soap_puthttphdr(). Definition at line 1892 of file stdsoap2.h. Referenced by soap_begin_recv(), soap_get(), and soap_getline(). Definition at line 1893 of file stdsoap2.h. Referenced by soap_begin_recv(), soap_char(), soap_end_recv(), soap_get(), soap_get_mime_attachment(), soap_getchar(), soap_getdime(), soap_getdimefield(), soap_getutf8(), and soap_peek_element(). Definition at line 1010 of file stdsoap2.h. Referenced by http_get(), and soap_set_fault(). Definition at line 1017 of file stdsoap2.h. Referenced by soap_getline(), and soap_set_fault(). Definition at line 855 of file stdsoap2.h. Definition at line 1013 of file stdsoap2.h. Referenced by http_head(), and soap_set_fault(). Definition at line 1021 of file stdsoap2.h. Referenced by soap_id_enter(), soap_id_forward(), soap_id_lookup(), and soap_set_fault(). Definition at line 1058 of file stdsoap2.h. Definition at line 1024 of file stdsoap2.h. Definition at line 1048 of file stdsoap2.h. Definition at line 1014 of file stdsoap2.h. Referenced by http_parse(), and soap_set_fault(). Definition at line 834 of file stdsoap2.h. Referenced by soap_free_iht(), soap_has_copies(), soap_hash(), soap_init_iht(), soap_resolve(), and soap_update_ptrs(). Definition at line 1902 of file stdsoap2.h. Referenced by MiriamWebServicesSoapBindingProxy::MiriamWebServicesSoapBindingProxy_init(), soap_init(), and soap_init2(). Definition at line 1159 of file stdsoap2.h. Referenced by soap_body_begin_in(), soap_body_begin_out(), and soap_element(). Definition at line 1155 of file stdsoap2.h. Referenced by soap_envelope_begin_in(), and soap_envelope_begin_out(). Definition at line 1156 of file stdsoap2.h. Referenced by soap_embedded_id(), soap_getheader(), soap_ignore_element(), soap_is_embedded(), soap_is_single(), and soap_putheader(). Definition at line 1164 of file stdsoap2.h. Definition at line 870 of file stdsoap2.h. Definition at line 871 of file stdsoap2.h. Definition at line 872 of file stdsoap2.h. Definition at line 1147 of file stdsoap2.h. Definition at line 766 of file stdsoap2.h. Definition at line 697 of file stdsoap2.h. Referenced by soap_accept(), soap_bind(), soap_done(), soap_init(), tcp_connect(), and tcp_disconnect(). Definition at line 1086 of file stdsoap2.h. Referenced by http_parse(), http_parse_header(), http_response(), soap_begin_count(), soap_begin_recv(), soap_begin_send(), soap_end_recv(), soap_end_send(), soap_flush_raw(), soap_get_http_body(), soap_putdime(), soap_puthttphdr(), soap_putmime(), soap_recv_raw(), soap_response(), soap_send_empty_response(), soap_send_raw(), and soap_try_connect_command(). Definition at line 1088 of file stdsoap2.h. Referenced by soap_begin_count(), soap_begin_send(), soap_response(), soap_send_empty_response(), soap_try_connect_command(), and tcp_connect(). Definition at line 1090 of file stdsoap2.h. Referenced by http_parse(), http_parse_header(), http_response(), soap_begin_count(), soap_begin_recv(), soap_end_recv(), soap_end_send(), soap_flush_raw(), soap_get_http_body(), soap_putdime(), soap_puthttphdr(), soap_putmime(), soap_recv_raw(), soap_response(), soap_send_empty_response(), and soap_try_connect_command(). Definition at line 1127 of file stdsoap2.h. Referenced by MiriamWebServicesSoapBindingProxy::MiriamWebServicesSoapBindingProxy(), soap_init(), and soap_new(). Definition at line 1087 of file stdsoap2.h. Referenced by soap_begin_count(), soap_begin_send(), soap_response(), and soap_try_connect_command(). Definition at line 1095 of file stdsoap2.h. Referenced by soap_accept(), soap_begin(), soap_begin_recv(), soap_begin_send(), soap_bind(), and soap_try_connect_command(). Definition at line 1094 of file stdsoap2.h. Referenced by MiriamWebServicesSoapBindingProxy::checkRegExp(), MiriamWebServicesSoapBindingProxy::getDataResources(), MiriamWebServicesSoapBindingProxy::getDataTypeDef(), MiriamWebServicesSoapBindingProxy::getDataTypePattern(), MiriamWebServicesSoapBindingProxy::getDataTypesId(), MiriamWebServicesSoapBindingProxy::getDataTypesName(), MiriamWebServicesSoapBindingProxy::getDataTypeSynonyms(), MiriamWebServicesSoapBindingProxy::getDataTypeURI(), MiriamWebServicesSoapBindingProxy::getDataTypeURIs(), MiriamWebServicesSoapBindingProxy::getJavaLibraryVersion(), MiriamWebServicesSoapBindingProxy::getLocation(), MiriamWebServicesSoapBindingProxy::getLocations(), MiriamWebServicesSoapBindingProxy::getLocations_(), MiriamWebServicesSoapBindingProxy::getMiriamURI(), MiriamWebServicesSoapBindingProxy::getName(), MiriamWebServicesSoapBindingProxy::getNames(), MiriamWebServicesSoapBindingProxy::getOfficialDataTypeURI(), MiriamWebServicesSoapBindingProxy::getResourceInfo(), MiriamWebServicesSoapBindingProxy::getResourceInstitution(), MiriamWebServicesSoapBindingProxy::getResourceLocation(), MiriamWebServicesSoapBindingProxy::getServicesInfo(), MiriamWebServicesSoapBindingProxy::getServicesVersion(), MiriamWebServicesSoapBindingProxy::getURI(), MiriamWebServicesSoapBindingProxy::isDeprecated(), soap_attachment(), soap_begin_count(), soap_begin_send(), soap_embedded_id(), soap_envelope_begin_out(), soap_envelope_end_out(), soap_is_embedded(), soap_is_single(), soap_send_fault(), soap_send_raw(), and soap_set_embedded(). Definition at line 1089 of file stdsoap2.h. Referenced by http_parse(), soap_begin_count(), soap_begin_send(), soap_end_send(), soap_flush_raw(), soap_putdime(), soap_putmime(), soap_response(), soap_send_raw(), and soap_try_connect_command(). Definition at line 1092 of file stdsoap2.h. Referenced by frecv(), fsend(), soap_accept(), soap_begin_send(), soap_bind(), soap_done(), soap_end_send(), soap_try_connect_command(), tcp_connect(), and tcp_disconnect(). Definition at line 1002 of file stdsoap2.h. Referenced by soap_in_ArrayOf_USCORExsd_USCOREstring(), and soap_set_fault(). Definition at line 982 of file stdsoap2.h. Referenced by soap_double2s(), and soap_float2s(). Definition at line 988 of file stdsoap2.h. Definition at line 989 of file stdsoap2.h. Definition at line 986 of file stdsoap2.h. Definition at line 987 of file stdsoap2.h. Definition at line 820 of file stdsoap2.h. Referenced by soap_append_lab(), and soap_peek_element(). Definition at line 1040 of file stdsoap2.h. Referenced by soap_set_fault(), soap_string_in(), and soap_wstring_in(). Definition at line 746 of file stdsoap2.h. Referenced by soap_LONG642s(), and soap_s2LONG64(). Definition at line 1190 of file stdsoap2.h. Referenced by soap_append_lab(), soap_begin_recv(), soap_begin_send(), soap_connect_command(), soap_copy_context(), soap_copy_stream(), soap_dime_forward(), soap_enter(), soap_envelope_begin_in(), soap_id_forward(), soap_init(), soap_link(), soap_malloc(), soap_new_block(), soap_peek_element(), soap_pointer_enter(), soap_push_block(), soap_push_namespace(), soap_push_ns(), soap_register_plugin_arg(), soap_set_attr(), and soap_set_local_namespaces(). Definition at line 884 of file stdsoap2.h. Referenced by soap_getsize(), and soap_getsizes(). Definition at line 862 of file stdsoap2.h. Definition at line 877 of file stdsoap2.h. Definition at line 869 of file stdsoap2.h. Referenced by soap_done(), and soap_init_logs(). Definition at line 1033 of file stdsoap2.h. Definition at line 1031 of file stdsoap2.h. 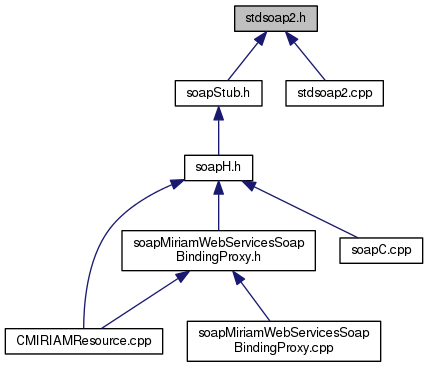 Referenced by soap_get_mime_attachment(), soap_getmimehdr(), and soap_set_fault(). Definition at line 1032 of file stdsoap2.h. Definition at line 1125 of file stdsoap2.h. Referenced by soap_check_mime_attachments(), soap_end_recv(), soap_get_mime_attachment(), and soap_post_check_mime_attachments(). Definition at line 1020 of file stdsoap2.h. Referenced by soap_resolve(), and soap_set_fault(). Definition at line 1016 of file stdsoap2.h. Referenced by soap_dealloc(), and soap_set_fault(). Definition at line 1003 of file stdsoap2.h. Referenced by soap_ignore_element(), soap_recv_fault(), and soap_set_fault(). Definition at line 1004 of file stdsoap2.h. Referenced by soap_current_namespace(), soap_match_namespace(), soap_match_tag(), soap_s2QName(), and soap_set_fault(). Definition at line 118 of file stdsoap2.h. Definition at line 1158 of file stdsoap2.h. Referenced by soap_body_begin_in(), and soap_body_end_in(). Definition at line 1009 of file stdsoap2.h. Referenced by soap_begin_recv(), soap_recv_empty_response(), and soap_set_fault(). Definition at line 1008 of file stdsoap2.h. Definition at line 1001 of file stdsoap2.h. Referenced by soap_element_begin_in(), soap_element_end_in(), soap_getindependent(), soap_ignore_element(), soap_in_ArrayOf_USCORExsd_USCOREstring(), soap_in_ns2__checkRegExp(), soap_in_ns2__checkRegExpResponse(), soap_in_ns2__getDataResources(), soap_in_ns2__getDataResourcesResponse(), soap_in_ns2__getDataTypeDef(), soap_in_ns2__getDataTypeDefResponse(), soap_in_ns2__getDataTypePattern(), soap_in_ns2__getDataTypePatternResponse(), soap_in_ns2__getDataTypesId(), soap_in_ns2__getDataTypesIdResponse(), soap_in_ns2__getDataTypesName(), soap_in_ns2__getDataTypesNameResponse(), soap_in_ns2__getDataTypeSynonyms(), soap_in_ns2__getDataTypeSynonymsResponse(), soap_in_ns2__getDataTypeURI(), soap_in_ns2__getDataTypeURIResponse(), soap_in_ns2__getDataTypeURIs(), soap_in_ns2__getDataTypeURIsResponse(), soap_in_ns2__getJavaLibraryVersion(), soap_in_ns2__getJavaLibraryVersionResponse(), soap_in_ns2__getLocation(), soap_in_ns2__getLocationResponse(), soap_in_ns2__getLocations(), soap_in_ns2__getLocations_(), soap_in_ns2__getLocationsResponse(), soap_in_ns2__getLocationsResponse_(), soap_in_ns2__getMiriamURI(), soap_in_ns2__getMiriamURIResponse(), soap_in_ns2__getName(), soap_in_ns2__getNameResponse(), soap_in_ns2__getNames(), soap_in_ns2__getNamesResponse(), soap_in_ns2__getOfficialDataTypeURI(), soap_in_ns2__getOfficialDataTypeURIResponse(), soap_in_ns2__getResourceInfo(), soap_in_ns2__getResourceInfoResponse(), soap_in_ns2__getResourceInstitution(), soap_in_ns2__getResourceInstitutionResponse(), soap_in_ns2__getResourceLocation(), soap_in_ns2__getResourceLocationResponse(), soap_in_ns2__getServicesInfo(), soap_in_ns2__getServicesInfoResponse(), soap_in_ns2__getServicesVersion(), soap_in_ns2__getServicesVersionResponse(), soap_in_ns2__getURI(), soap_in_ns2__getURIResponse(), soap_in_ns2__isDeprecated(), soap_in_ns2__isDeprecatedResponse(), soap_in_SOAP_ENV__Code(), soap_in_SOAP_ENV__Detail(), soap_in_SOAP_ENV__Fault(), soap_in_SOAP_ENV__Header(), soap_in_SOAP_ENV__Reason(), soap_inliteral(), soap_instring(), soap_inwliteral(), soap_inwstring(), soap_peek_element(), and soap_set_fault(). Definition at line 1146 of file stdsoap2.h. Definition at line 1018 of file stdsoap2.h. Referenced by soap_element_begin_in(), and soap_set_fault(). Definition at line 1039 of file stdsoap2.h. Referenced by soap_in_ns2__checkRegExp(), soap_in_ns2__checkRegExpResponse(), soap_in_ns2__getDataResources(), soap_in_ns2__getDataTypeDef(), soap_in_ns2__getDataTypeDefResponse(), soap_in_ns2__getDataTypePattern(), soap_in_ns2__getDataTypePatternResponse(), soap_in_ns2__getDataTypeSynonyms(), soap_in_ns2__getDataTypeURI(), soap_in_ns2__getDataTypeURIResponse(), soap_in_ns2__getDataTypeURIs(), soap_in_ns2__getJavaLibraryVersionResponse(), soap_in_ns2__getLocation(), soap_in_ns2__getLocationResponse(), soap_in_ns2__getLocations(), soap_in_ns2__getLocations_(), soap_in_ns2__getMiriamURI(), soap_in_ns2__getMiriamURIResponse(), soap_in_ns2__getName(), soap_in_ns2__getNameResponse(), soap_in_ns2__getNames(), soap_in_ns2__getOfficialDataTypeURI(), soap_in_ns2__getOfficialDataTypeURIResponse(), soap_in_ns2__getResourceInfo(), soap_in_ns2__getResourceInfoResponse(), soap_in_ns2__getResourceInstitution(), soap_in_ns2__getResourceInstitutionResponse(), soap_in_ns2__getResourceLocation(), soap_in_ns2__getResourceLocationResponse(), soap_in_ns2__getServicesInfoResponse(), soap_in_ns2__getServicesVersionResponse(), soap_in_ns2__getURI(), soap_in_ns2__getURIResponse(), soap_in_ns2__isDeprecated(), soap_in_ns2__isDeprecatedResponse(), and soap_set_fault(). Definition at line 995 of file stdsoap2.h. Referenced by fsend(), http_parse(), http_parse_header(), http_post(), http_send_header(), soap_accept(), soap_append_lab(), soap_attribute(), soap_begin(), soap_begin_count(), soap_begin_recv(), soap_begin_send(), soap_body_begin_in(), soap_body_end_in(), soap_body_end_out(), soap_connect_command(), soap_copy_context(), soap_dime_forward(), soap_element(), soap_element_begin_in(), soap_element_begin_out(), soap_element_end_in(), soap_element_end_out(), soap_element_href(), soap_element_null(), soap_element_result(), soap_element_start_end_out(), soap_end_count(), soap_end_recv(), soap_end_send(), soap_envelope_begin_in(), soap_envelope_end_out(), soap_fdelete(), soap_flush(), soap_flush_raw(), soap_getattrval(), soap_getdime(), soap_getdimehdr(), soap_getindependent(), soap_getline(), soap_getmimehdr(), soap_has_copies(), soap_ignore_element(), soap_in_ArrayOf_USCORExsd_USCOREstring(), soap_inliteral(), soap_instring(), soap_inwliteral(), soap_inwstring(), soap_isnumeric(), soap_match_array(), soap_match_namespace(), soap_match_tag(), soap_move(), soap_out_std__string(), soap_outliteral(), soap_outstring(), soap_outwliteral(), soap_outwstring(), soap_peek_element(), soap_poll(), soap_push_namespace(), soap_putbase64(), soap_putdime(), soap_putdimehdr(), soap_putelement(), soap_putfault(), soap_putheader(), soap_puthex(), soap_puthttphdr(), soap_putindependent(), soap_putmime(), soap_recv(), soap_recv_empty_response(), soap_recv_fault(), soap_recv_header(), soap_recv_raw(), soap_register_plugin_arg(), soap_resolve(), soap_response(), soap_retry(), soap_s2wchar(), soap_send(), soap_send_empty_response(), soap_send_fault(), soap_send_raw(), soap_set_attr(), soap_set_dime_attachment(), soap_set_mime_attachment(), soap_set_namespaces(), soap_string_out(), soap_try_connect_command(), soap_valid_mime_boundary(), soap_wstring_out(), soap_xop_forward(), tcp_disconnect(), tcp_gethost(), and CMIRIAMResources::updateMIRIAMResources(). Definition at line 1905 of file stdsoap2.h. Definition at line 1035 of file stdsoap2.h. Definition at line 1063 of file stdsoap2.h. Referenced by soap_connect(), soap_end_send(), and soap_try_connect_command(). Definition at line 1038 of file stdsoap2.h. Referenced by soap_attr_value(), and soap_set_fault(). Definition at line 823 of file stdsoap2.h. Definition at line 827 of file stdsoap2.h. Referenced by soap_free_pht(), soap_init_pht(), and soap_putindependent(). Definition at line 1011 of file stdsoap2.h. Referenced by http_put(), and soap_set_fault(). Definition at line 1936 of file stdsoap2.h. Referenced by fsend(), and soap_select_mime_boundary(). Definition at line 1901 of file stdsoap2.h. Definition at line 1037 of file stdsoap2.h. Definition at line 804 of file stdsoap2.h. Definition at line 1899 of file stdsoap2.h. Referenced by soap_begin_recv(), soap_get(), and soap_getutf8(). Definition at line 1903 of file stdsoap2.h. Definition at line 1908 of file stdsoap2.h. Definition at line 1906 of file stdsoap2.h. Definition at line 1044 of file stdsoap2.h. Definition at line 692 of file stdsoap2.h. Referenced by tcp_accept(), and tcp_connect(). Definition at line 803 of file stdsoap2.h. Referenced by frecv(), fsend(), soap_accept(), soap_bind(), soap_poll(), tcp_connect(), and tcp_disconnect(). Definition at line 684 of file stdsoap2.h. Referenced by frecv(), tcp_accept(), and tcp_connect(). Definition at line 122 of file stdsoap2.h. Definition at line 1135 of file stdsoap2.h. Definition at line 1142 of file stdsoap2.h. Definition at line 1025 of file stdsoap2.h. Referenced by soap_closesock(), soap_set_fault(), tcp_connect(), and tcp_disconnect(). Definition at line 1046 of file stdsoap2.h. Definition at line 1131 of file stdsoap2.h. Definition at line 1136 of file stdsoap2.h. Definition at line 1133 of file stdsoap2.h. Definition at line 1132 of file stdsoap2.h. Definition at line 1137 of file stdsoap2.h. Definition at line 1134 of file stdsoap2.h. Definition at line 1138 of file stdsoap2.h. Definition at line 1140 of file stdsoap2.h. Definition at line 1594 of file stdsoap2.h. Definition at line 1056 of file stdsoap2.h. Referenced by http_parse(), soap_begin_recv(), soap_end_send(), soap_send_fault(), and soap_set_fault(). Definition at line 650 of file stdsoap2.h. Referenced by soap_match_tag(), and soap_peek_element(). Definition at line 1913 of file stdsoap2.h. Referenced by soap_array_begin_out(), and soap_peek_element(). Definition at line 1919 of file stdsoap2.h. Referenced by soap_char(), soap_getsize(), soap_s2byte(), soap_s2int(), soap_s2long(), and soap_s2short(). Definition at line 1925 of file stdsoap2.h. Referenced by http_parse(), http_parse_header(), soap_recv_raw(), soap_s2unsignedByte(), soap_s2unsignedInt(), soap_s2unsignedLong(), and soap_s2unsignedShort(). Definition at line 997 of file stdsoap2.h. Definition at line 1000 of file stdsoap2.h. Referenced by soap_element_end_in(), soap_match_namespace(), soap_peek_element(), and soap_set_fault(). Definition at line 998 of file stdsoap2.h. Referenced by MiriamWebServicesSoapBindingProxy::checkRegExp(), MiriamWebServicesSoapBindingProxy::getDataResources(), MiriamWebServicesSoapBindingProxy::getDataTypeDef(), MiriamWebServicesSoapBindingProxy::getDataTypePattern(), MiriamWebServicesSoapBindingProxy::getDataTypesId(), MiriamWebServicesSoapBindingProxy::getDataTypesName(), MiriamWebServicesSoapBindingProxy::getDataTypeSynonyms(), MiriamWebServicesSoapBindingProxy::getDataTypeURI(), MiriamWebServicesSoapBindingProxy::getDataTypeURIs(), MiriamWebServicesSoapBindingProxy::getJavaLibraryVersion(), MiriamWebServicesSoapBindingProxy::getLocation(), MiriamWebServicesSoapBindingProxy::getLocations(), MiriamWebServicesSoapBindingProxy::getLocations_(), MiriamWebServicesSoapBindingProxy::getMiriamURI(), MiriamWebServicesSoapBindingProxy::getName(), MiriamWebServicesSoapBindingProxy::getNames(), MiriamWebServicesSoapBindingProxy::getOfficialDataTypeURI(), MiriamWebServicesSoapBindingProxy::getResourceInfo(), MiriamWebServicesSoapBindingProxy::getResourceInstitution(), MiriamWebServicesSoapBindingProxy::getResourceLocation(), MiriamWebServicesSoapBindingProxy::getServicesInfo(), MiriamWebServicesSoapBindingProxy::getServicesVersion(), MiriamWebServicesSoapBindingProxy::getURI(), MiriamWebServicesSoapBindingProxy::isDeprecated(), soap_element_begin_in(), soap_envelope_begin_in(), soap_getelement(), soap_ignore_element(), soap_in_ns2__checkRegExp(), soap_in_ns2__checkRegExpResponse(), soap_in_ns2__getDataResources(), soap_in_ns2__getDataResourcesResponse(), soap_in_ns2__getDataTypeDef(), soap_in_ns2__getDataTypeDefResponse(), soap_in_ns2__getDataTypePattern(), soap_in_ns2__getDataTypePatternResponse(), soap_in_ns2__getDataTypesId(), soap_in_ns2__getDataTypesIdResponse(), soap_in_ns2__getDataTypesName(), soap_in_ns2__getDataTypesNameResponse(), soap_in_ns2__getDataTypeSynonyms(), soap_in_ns2__getDataTypeSynonymsResponse(), soap_in_ns2__getDataTypeURI(), soap_in_ns2__getDataTypeURIResponse(), soap_in_ns2__getDataTypeURIs(), soap_in_ns2__getDataTypeURIsResponse(), soap_in_ns2__getJavaLibraryVersion(), soap_in_ns2__getJavaLibraryVersionResponse(), soap_in_ns2__getLocation(), soap_in_ns2__getLocationResponse(), soap_in_ns2__getLocations(), soap_in_ns2__getLocations_(), soap_in_ns2__getLocationsResponse(), soap_in_ns2__getLocationsResponse_(), soap_in_ns2__getMiriamURI(), soap_in_ns2__getMiriamURIResponse(), soap_in_ns2__getName(), soap_in_ns2__getNameResponse(), soap_in_ns2__getNames(), soap_in_ns2__getNamesResponse(), soap_in_ns2__getOfficialDataTypeURI(), soap_in_ns2__getOfficialDataTypeURIResponse(), soap_in_ns2__getResourceInfo(), soap_in_ns2__getResourceInfoResponse(), soap_in_ns2__getResourceInstitution(), soap_in_ns2__getResourceInstitutionResponse(), soap_in_ns2__getResourceLocation(), soap_in_ns2__getResourceLocationResponse(), soap_in_ns2__getServicesInfo(), soap_in_ns2__getServicesInfoResponse(), soap_in_ns2__getServicesVersion(), soap_in_ns2__getServicesVersionResponse(), soap_in_ns2__getURI(), soap_in_ns2__getURIResponse(), soap_in_ns2__isDeprecated(), soap_in_ns2__isDeprecatedResponse(), soap_in_SOAP_ENV__Code(), soap_in_SOAP_ENV__Detail(), soap_in_SOAP_ENV__Fault(), soap_in_SOAP_ENV__Header(), soap_in_SOAP_ENV__Reason(), soap_match_array(), soap_match_tag(), soap_recv_header(), and soap_set_fault(). Definition at line 848 of file stdsoap2.h. Definition at line 1023 of file stdsoap2.h. Referenced by soap_accept(), soap_bind(), soap_closesock(), soap_connect_command(), soap_poll(), soap_set_fault(), and tcp_connect(). Definition at line 1045 of file stdsoap2.h. Definition at line 1139 of file stdsoap2.h. Definition at line 999 of file stdsoap2.h. Referenced by soap_base642s(), soap_element_begin_in(), soap_getbase64(), soap_gethex(), soap_in_ArrayOf_USCORExsd_USCOREstring(), soap_inbyte(), soap_indateTime(), soap_inint(), soap_inlong(), soap_inLONG64(), soap_inshort(), soap_inULONG64(), soap_inunsignedByte(), soap_inunsignedInt(), soap_inunsignedLong(), soap_inunsignedShort(), soap_isnumeric(), soap_s2byte(), soap_s2dateTime(), soap_s2double(), soap_s2float(), soap_s2int(), soap_s2long(), soap_s2LONG64(), soap_s2short(), soap_s2ULONG64(), soap_s2unsignedByte(), soap_s2unsignedInt(), soap_s2unsignedLong(), soap_s2unsignedShort(), and soap_set_fault(). Definition at line 1022 of file stdsoap2.h. Referenced by soap_begin_send(), and soap_set_fault(). Definition at line 750 of file stdsoap2.h. Referenced by soap_s2ULONG64(), and soap_ULONG642s(). Definition at line 1900 of file stdsoap2.h. Referenced by soap_begin_recv(), soap_element_end_in(), soap_get(), soap_getattrval(), soap_getbase64(), soap_getdimehdr(), soap_gethex(), soap_inliteral(), soap_inwliteral(), soap_peek_element(), soap_string_in(), soap_value(), and soap_wstring_in(). Definition at line 1005 of file stdsoap2.h. Definition at line 698 of file stdsoap2.h. Referenced by frecv(), fsend(), http_response(), soap_accept(), soap_begin_recv(), soap_begin_send(), soap_bind(), soap_done(), soap_end_send(), soap_poll(), soap_send_fault(), soap_try_connect_command(), tcp_connect(), and tcp_disconnect(). Definition at line 1034 of file stdsoap2.h. Referenced by soap_envelope_begin_in(), soap_recv_fault(), and soap_set_fault(). Definition at line 587 of file stdsoap2.h. Definition at line 1109 of file stdsoap2.h. Referenced by soap_array_begin_out(), soap_attribute(), soap_clr_attr(), soap_element(), soap_element_end_out(), soap_element_start_end_out(), soap_QName2s(), soap_set_attr(), soap_string_out(), and soap_wstring_out(). Definition at line 1113 of file stdsoap2.h. Referenced by soap_attribute(), soap_element(), soap_element_end_in(), soap_element_end_out(), soap_element_start_end_out(), soap_getbase64(), soap_gethex(), soap_peek_element(), soap_putbase64(), soap_puthex(), soap_string_in(), soap_string_out(), soap_value(), soap_wstring_in(), and soap_wstring_out(). Definition at line 1043 of file stdsoap2.h. Definition at line 1111 of file stdsoap2.h. Referenced by soap_begin_count(), soap_begin_send(), soap_embedded_id(), soap_is_embedded(), soap_peek_element(), and soap_putindependent(). Definition at line 1108 of file stdsoap2.h. Referenced by soap_element(), and soap_element_end_out(). Definition at line 1112 of file stdsoap2.h. Definition at line 1114 of file stdsoap2.h. Referenced by soap_body_begin_out(), soap_element(), and soap_end_send(). Definition at line 1107 of file stdsoap2.h. Referenced by soap_attr_value(), soap_element_begin_in(), soap_element_end_in(), soap_ignore_element(), soap_in_ns2__checkRegExp(), soap_in_ns2__checkRegExpResponse(), soap_in_ns2__getDataResources(), soap_in_ns2__getDataTypeDef(), soap_in_ns2__getDataTypeDefResponse(), soap_in_ns2__getDataTypePattern(), soap_in_ns2__getDataTypePatternResponse(), soap_in_ns2__getDataTypeSynonyms(), soap_in_ns2__getDataTypeURI(), soap_in_ns2__getDataTypeURIResponse(), soap_in_ns2__getDataTypeURIs(), soap_in_ns2__getJavaLibraryVersionResponse(), soap_in_ns2__getLocation(), soap_in_ns2__getLocationResponse(), soap_in_ns2__getLocations(), soap_in_ns2__getLocations_(), soap_in_ns2__getMiriamURI(), soap_in_ns2__getMiriamURIResponse(), soap_in_ns2__getName(), soap_in_ns2__getNameResponse(), soap_in_ns2__getNames(), soap_in_ns2__getOfficialDataTypeURI(), soap_in_ns2__getOfficialDataTypeURIResponse(), soap_in_ns2__getResourceInfo(), soap_in_ns2__getResourceInfoResponse(), soap_in_ns2__getResourceInstitution(), soap_in_ns2__getResourceInstitutionResponse(), soap_in_ns2__getResourceLocation(), soap_in_ns2__getResourceLocationResponse(), soap_in_ns2__getServicesInfoResponse(), soap_in_ns2__getServicesVersionResponse(), soap_in_ns2__getURI(), soap_in_ns2__getURIResponse(), soap_in_ns2__isDeprecated(), soap_in_ns2__isDeprecatedResponse(), soap_s2int(), soap_s2long(), soap_s2LONG64(), soap_s2ULONG64(), soap_s2unsignedInt(), soap_s2unsignedLong(), soap_string_in(), and soap_wstring_in(). Definition at line 1110 of file stdsoap2.h. Referenced by soap_begin_count(), soap_begin_send(), soap_element_id(), soap_embedded_id(), soap_peek_element(), soap_putindependent(), and soap_reference(). Definition at line 1078 of file stdsoap2.h. Referenced by http_parse_header(), soap_begin_recv(), soap_begin_send(), soap_closesock(), soap_end_send(), and soap_puthttphdr(). Definition at line 1026 of file stdsoap2.h. Referenced by http_parse_header(), soap_begin_recv(), soap_begin_send(), soap_end_recv(), soap_end_send(), soap_flush(), soap_recv_raw(), and soap_set_fault(). Definition at line 1047 of file stdsoap2.h. Definition at line 1080 of file stdsoap2.h. Referenced by http_parse_header(), soap_begin_recv(), soap_begin_send(), soap_end_recv(), and soap_recv_raw(). Definition at line 1079 of file stdsoap2.h. Referenced by soap_begin_recv(), and soap_closesock(). Definition at line 1077 of file stdsoap2.h. Referenced by http_parse_header(), soap_begin_recv(), soap_closesock(), soap_copy_stream(), soap_end_recv(), soap_end_send(), and soap_init(). Definition at line 143 of file stdsoap2.h. Definition at line 734 of file stdsoap2.h. Definition at line 127 of file stdsoap2.h. Definition at line 1084 of file stdsoap2.h. Definition at line 1257 of file stdsoap2.h. Definition at line 1425 of file stdsoap2.h.